Polygonum odoratum. Sun to Partial Sun. Perennial. Height 12”. hot weather and grows well indoors. Vietnamese Coriander is more like mint than cilantro. It requires a moist, nutrient rich soil in a container or in your garden. It is fast growing and does best with the morning sun and afternoon shade. Cutting the plant back as you use it will promote additional growth. Give this plant plenty of space because it will spread out in a clumps but is not as invasive as mint. 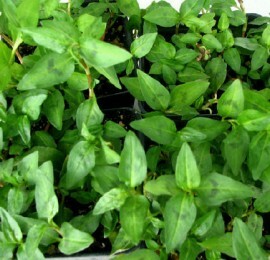 Vietnamese Coriander is also known as Rau Ram. It is a staple in Vietnamese cooking and is essential when making “laksa” which is a Vietnamese soup. You can also use it in salads, chicken salad, summer rolls, and soups. It is a tender perennial so it will provide you with that coriander flavor year around.